Must-Have-Level: 6/7, I wouldn’t want to miss it on my desk or when out exploring. Audience: First-time visitors to Kyoto (if they love gardens and explore on their own), students of Japanese garden culture and seasoned Japanese garden veterans. Character: “Serious Japanese garden book” – no dreamy photographs or romantic descriptions to be found here. It’s a reference book, a guide book and great introduction to the history of the garden culture in Kyoto. What I like about it: Its small size allows me to take it along, so I am able to read ABOUT the garden when I am IN the garden. The thing is: If I read about the garden before my visit I forget 90% of the information, because I have a hard time visualizing the gardens; if I read about it afterwards, I realized I missed half of the details and context. Description: A Guide to the Gardens of Kyoto introduces 50-something gardens in Japan’s ancient capital Kyoto. The text for each garden is short and very precise, conveying the feeling of the garden as well as the facts and some background knowledge. The average garden gets a description of one or two pages, and a black-and-white photograph. Some more important gardens like Saiho-ji and Katsura-Rikyu get four to five pages. In addition to the description of the garden, each chapter features the time period it was built in, with remarks to major restorations, and in the case of a temple, the branch of Buddhism to which it belongs. The address, opening times are featured as well, and whether a permission is needed to visit the garden or take pictures in the garden. I tremendously enjoyed reading the 50-page long introduction to the cultural context of Japanese gardens, out of which 20 pages are devoted to the history of the Kyoto area. I also like the suggested reading list – a fountain of books to add to my to-read list. 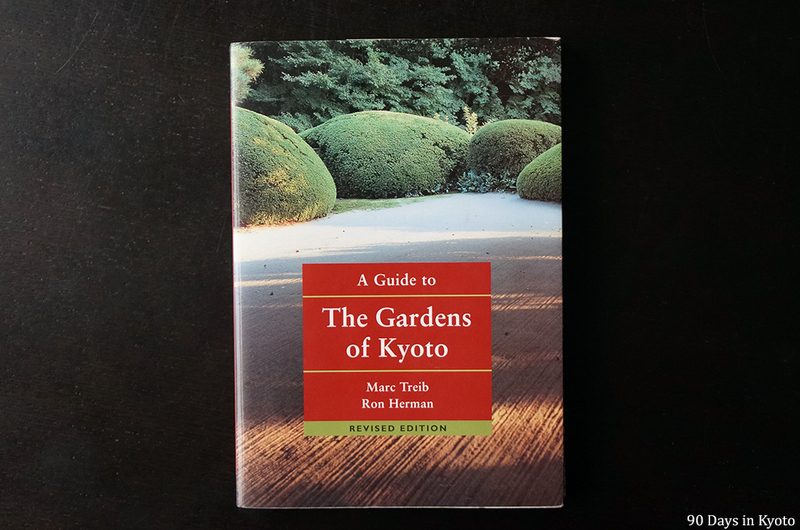 The book was written by Marc Treib, a (now retired) professor of Architecture of UC Berkeley and Ron Herman, a landscape architect in the San Francisco bay area, who has spent many years researching Japanese gardens. This is the second edition from 2003, the first edition was published in 1979.